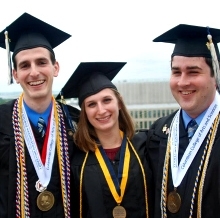 The University Honors Program community extends beyond the four years spent at the George Washington University. While many alumni continue their education in graduate programs across the country and throughout the world, Honors alums go on to pursue a wide range of careers. We are proud of our students and invite their continued participation in the program, whether through occasional events that we host to celebrate our alumni or through networking opportunities that we seek to provide to our current students. We are eager to stay in touch and to spread the word of your post-graduation paths, so please connect with us at Facebook, Twitter, LinkedIn, and contact the GW Alumni Office to let them know you're an Honors alumnus. Contact Ben Faulkner at [email protected] if you are interested in being featured on our blog or Alumni Spotlights page!